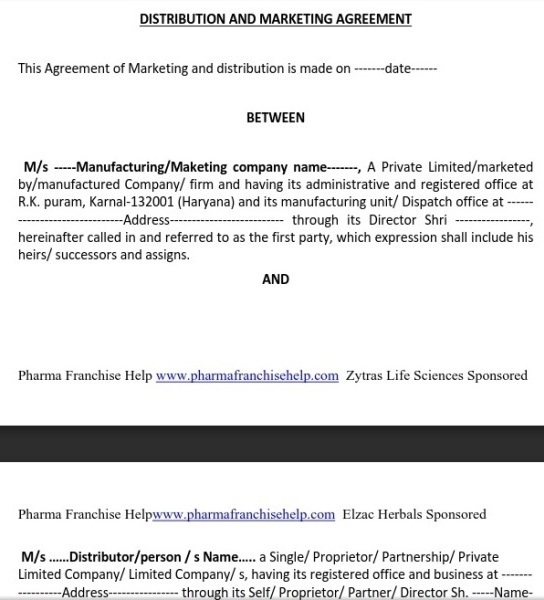 Pharma franchise agreement is signed between pharma franchise company(franchiser) and pharma franchise distributor (franchisee). It is based upon mutually agreed terms & conditions that are accepted by the both parties and both parties has agreed to start/continue business with each other. Agreement should have many character sticks and qualities that could be fruitful for both. Pharma franchise agreement is must to create faith and good business. heirs / successors and assigns. That the Second Party is person/ trading/ marketing/ distributor/ c&f of Pharmaceutical formulations. Drugs & Medicines and is interested in marketing and distribution of first party products under its brand names on the basis of franchise/ PCD basis. Second party will promote, sell and distribute First party’s products in the allocated territory only. Second Party will not sell the same outside of its territory even by any of its suppliers or other source. Second party will be promoting minimum of 8 products from the product range. Second party needs to give first party, the details of district wise expectation of business, if you require more than one district. The net rates to be charged shall be mutually decided batch wise depending on the various factors such as batch size, cost of raw materials, excipients at the time of batch processing, or as agreed mutually between the parties. Second party will market product at ethical basis and will sale it at pts or ptr basis except in case of hospital and institutional supply. Second party will provide the Xerox copy of CST, DL and VAT certificate along with the supportive documents pertaining to dispatch like road permit etc. That the First Party has agreed to provide the products to the Second Party as per list annexed to this agreement on the basis at net rate basis and the products to be marketed/ manufactured by the first party. That the above brand names are for the exclusive use of the Second Party and that these brand names would neither be given to any other marketing or distribution organization nor would they be used by the First Party for marketing and distribution in assigned area to second party. That the First Party is at Liberty to get the above mentioned brand names registered with the appropriate authorities for their exclusive use at its cost. The Second Party will not get the brand names registered with the trade mark authority for any of the product of the First Party. All rights, titles and interests in the trade marks including artistic work thereof appearing on the PRODUCT/s or cartons etc shall always vest with —company name– and —–Second party name—- shall not at any point of time acquire any right, title or interest in such trade mark. First party shall supply second party one set of product catalogue at free of cost and will be supplying you 10% of empty catch covers of the products free of cost, based on your product purchase. However the samples with tablets will be charged extra. Goods will be supplied on ruling price at the time of dispatch. Second party will be providing “C” Form if necessary with its purchase order otherwise CST will be charged at the rate of 5.25% or as applicable. That the First Party shall provide all marketing and promotional material. They shall get all the printed matter details and get their product cards, literature etc printed in confirmation to the provision of Drugs and Cosmetics Act and at their cost. The second Party holds the right to reject to receive promotional and marketing material and make available at its own cost and by itself but prior approval is required from first party. That the First Party will charge —–% of the amount of bill for insurance against transit loss. The marine declaration form will be sent along with the copy of bill. The Second party will claim from the insurer on the basis of marine declaration for the breakage and shortage if any with the insurance company. The First Party will in no way be responsible for the same. Expiry will be responsibility of second party. Products once sold will not be taken back. That in case due to any technical flaw or amendment to any Act and rules of the Central / State Excise or any other tax or surcharge is levied or imposed by the authority of Central Excise Department at a later stage or date on the products, the Second Party will be fully responsible and accountable for such duties, and the Second Party will bear such duties or the amount imposed including penalty if any and pay either to the First party or to the department concerned. The Products shall be delivered from dispatched premises of First party located at —city name—- within 3 to 4 days from the date receipt of purchase order along with advance or as agreed mutually herein under from the Second Party or the availability of products whichever is later. Payment terms: Advance payment of the products ordered shall be released by the Second Party along with purchase order or as agreed mutually between the parties. The first party ceases all responsibility and risks such as shortage, damage, dent, breakage, spoilage, short delivery and non- delivery of consignment once the products has been dispatched from their warehouse. First party warrants that it will supply PRODUCT / s of superior quality manufactured/ marketed by and packed in accordance with relevant Good Manufacturing Practice (GMP) standards/norms as specified by the relevant regulatory authorities, as applicable from time to time. Second party will be entitled to ascertain whether the PRODUCT/ Samples received adhere to quality specifications on the receipt of the PRODUCT/ Samples First party. First party will send sample of each batch of PRODUCT/s along with Certificate of Analysis to the Quality Control Department of ………. In case of ………..,in its opinion finds that the specified product do not meet agreed quality specifications and if First party disagrees with such findings of ……….., in this respect, product samples will be referred to an independent mutually acceptable outside laboratory for testing of the PRODUCT/s. The findings of such testing shall be final and the cost of such testing will be to the account of the losing party. This agreement shall come into force on its execution and shall continue in force for a period of 3 years. Thereafter, this agreement shall stand renewed for further period of 3 years on mutually agreed terms. It is agreed that any delay breach or failure on the part of either party on complying with the terms and conditions of this agreement shall not be treated as default or breach or give any rise to any claim for damage to or in favor of either party, if any to the extent, such delay, breach or failure is caused by occurrences beyond the control of either party including but not limited to acts of God, fires, floods, explosions, war, civil commotion, strikes, lockouts, statutory prohibitions, shortages of materials and other similar causes. The party claming an event of force majeure shall as soon as possible notify the other party in writing and provide all the particulars of the cause or event and date of its first occurrence. Failure to give such a notice to other party shall deprive the party claiming force majeure to be relieved from performing its obligations under this agreement. If, the force majeure in question prevails for a continuous period in excess of six months, the parties shall enter into bonafide discussions with a view to alleviating its effects or to agree upon such alternative agreements as may be fair and reasonable. In case no such arrangements be agreed upon the other party not affected by force majeure will be entitled to terminate this agreement by giving three months notice to the Party affected by force majeure will be entitled to terminate this agreement by giving three months notice to the Party affected by force majeure. In the event of any dispute, controversy or claim arising out of or relating to this agreement or the breach, termination or invalidity thereof, the parties shall endeavor to resolve the same in an amicable manner in consonance with the spirit of the transaction recorded in this agreement. If, however, parties fail to resolve such dispute through discussions as above, the same shall at the request of either party be referred to and settled by arbitration in accordance with the Arbitration & Conciliation Act, 1996. The place of Arbitration shall be —city name— and language to be used in such arbitration proceedings shall be English. Any judgement, decision or award of the arbitrators shall be final and binding and shall be enforceable in any court of competent jurisdiction. The agreement will be governed by the laws of India and the parties submit to the jurisdiction of the Courts of —–city name—-. agreed upon by both the parties. How to take agreement from a pharmaceutical company for marketing their products in my respective zone? I need a sample format for monopoly agreement and rules and regulations for monopoly agreement.